According to the family, when I said: “Prince Kosoko, who was Oba Eshilokun’s son, did not wait to be King before becoming a major slave trader. Princess Opo Olu, Kosoko’s sister owned 1400 slaves. Oshodi Tapa, Dada Antonio and Ojo Akanbi, like Ajayi Crowther, were former slaves, but unlike Crowther, they rose to become merchants themselves.” They reckoned I meant that Oshodi Tapa was a slave of Prince Kosoko. In that passage, I was listing the personalities who were slave traders and those who were ex-slaves; I was not listing those who owned slaves. Ajayi Crowther was enslaved in March 1821 at his village of Oshogun, 140km north of Lagos by Fulani slavers who capitalised on the weakened Oyo Empire to attack his village. Crowther, a boy of 12 years old was exchanged for a horse. The lady who brought him later exchanged him for tobacco leaves and a bottle of English wine from an Ijebu man who in turn sold him in Lagos to the Portuguese slave ship, Esperenza Feliz (meaning Free Spirit). Oba Eshilokun was the king at that time. Like his children – Princess Opo Olu and Princes Idewu Ojulari and Kosoko – Eshilokun was a slave exporter and price fixer who would not allow market forces to determine slave prices, and hence owned slave warehouses. There was no record that he or his family owned Crowther, but he received commission on his sale, because as the Oba of Lagos, he had put in place a rigorous and aggressive tax system which ensured that for every slave ship that docked in Lagos and every slave sold to those ships, his cut was assured. Antonio Landuji Oshodi Tapa was a prince in Nupe land when Usman Dan Fodio’s jihad, spreading Fulani warriors, invaded. They murdered his parents and sold him into slavery down south. According to the version of history that the family narrated in their press release, “Chief Oshodi-Tapa, a prince by his own right migrated from Bida in the present day Niger State of Nigeria. On arrival in Lagos, Chief Fagbemi, who reported to the then King Eshilokun, announced him. After consultation with the Ifa Oracle, the King asked Oshodi to stay with Fagbemi. He later moved to the Oba’s Palace and was placed in charge of the inner section to oversee security.” The problem with legends like this is that they corrupt the truth and like myth, they are careless with details. Little Oshodi was a boy slave who outsmarted his tribulations. About to be loaded onto a transatlantic slave ship in Lagos, he fled in search of the town’s palace for refuge. This presented Oba Eshilokun with a conundrum. He was a major player in the slave trade who even numbered children amongst his merchandise. However, the religious algorithm that entrenched slavery asserted that one’s destiny as a slave was far more superior to one’s capacity to feel pain. And here was a little boy, an ajoji (foreigner) asking the king to consider his pain over the weight of his chains. The call was too tough for Eshilokun that he sought guidance from Ifa divination. Eshilokun raised Oshodi like one of his own children. Singling him out as a foreigner, he was called Tapa (the Yoruba designation for Nupe people), yet he enjoyed greater entitlements than a native. He was called ‘Oshodi’, meaning – the royal chamberlain – tasked with the wellbeing of the king’s wives. A great position of trust and kindliness it was. However, if being concerned about the pain of others and imagining what it is to be someone other than oneself is the essence of compassion and the beginning of morality, why did Oshodi who knew about the horrors of being a slave invert to be one of the biggest slave brokers of his time? How come he was indifferent to the anguish of slaves and the pain of separation and loss he was inflicting on the slaves’ families? One would expect from him an outbreak of anti-slavery consciousness, just like Ajayi Crowther who refused to be inverted but grew up to be militantly anti-slavery, thus becoming Nigeria’s Founding Father. Well, part of the reason may be due to the improbable kindness shown to Oshodi by the royal household; it radicalised his loyalty to the family business just like the restoration of Crowther’s freedom and dignity by the Royal Navy and British missionaries increased his devotion to Queen Victoria and the British culture. When a Portuguese business partner asked Eshilokun for one of his sons to receive structured training in international slave valuation and management, contract enforcement, credit protection, shipping and diplomatic relations at a slave business school in Bahia, Eshilokun not totally trusting his business partner, hedged his bets by sending Oshodi Tapa instead of his own sons, Idewu Ojulari or Kosoko. It later paid off. Oshodi Tapa acquired the name Antonio in Brazil which was then a Portuguese colony. Meanwhile in 1764, Britain won the seven year war against the Franco-Spanish alliance and was established as the undisputed military force in Europe and the world. The justification for slavery in England weakened with Lord Mansfield’s 1772 landmark ruling in the Somerset vs Stewart case. James Somerset was an upper-class American slave of West African origin whom his trusting master, Charles Stewart took for a business and family trip to England. He ran away. His master eventually caught him, stripped him of privileges and was about to deport him to a Caribbean sugar plantation. In the ruling, Lord Mansfield, the Chief Justice of England (the Mansfield of Jane Austen’s Mansfield Park), argued that the English common law did not support slavery and once a slave stepped onto an English soil, he was free. Dido Belle, Mansfield’s grandniece living at his home was black, his mother, a slave and that rendered her legally a slave. His mother was on a Spanish slave ship seized by the Royal Navy in the Caribbean. Mansfield, inspired by his domestic experience, gave a ruling that set about a policy of dismantling slavery. Unlike the American Founding Fathers like George Washington, James Madison and Thomas Jefferson who were proclaiming a freedom-loving America and were writing lofty treatises on the right to liberty, equality and pursuit of happiness yet kept their domestic slaves wretched and unfree. Mansfield’s anti-slavery ruling contributed to the American elite’s decision to seek freedom from Britain. Reeling from the humiliation of the seven year war, France supported America during the War of Independence (1775-1783). With the war won, France donated to America the biggest statue the world had ever seen then – the stature of liberty, while America continued her unquenchable thirst for African slaves. Of all the slaves shipped to America, the Caribbean and Latin America up till the end of 18th century, none came from the South African coast, while 56 percent came from the West African coast. Lagos was not one of them. 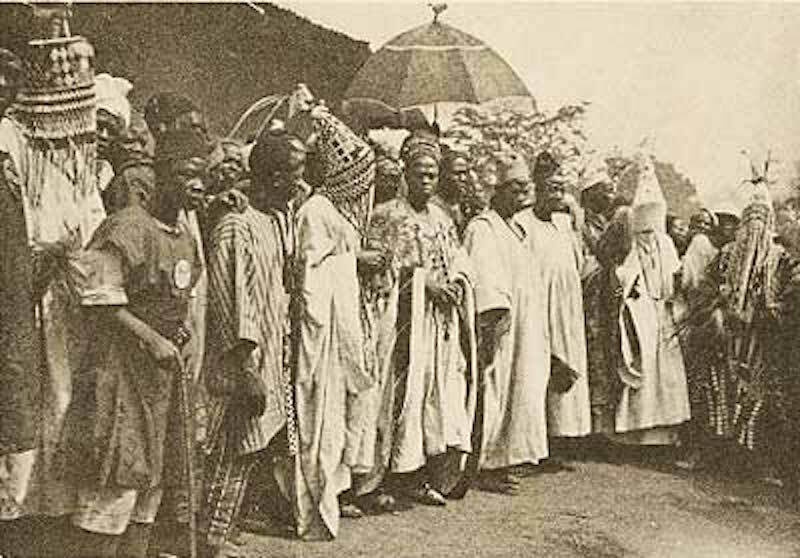 However, a disagreement broke out between Oba Gabaro and his brother Prince Akinsemoyin over Gabaro’s giving of the indigenous people of Lagos, the Olofin people (and their Idejo chiefs), exclusive estate rights to Lagos, while they the royalty who were descendants from Benin kept only the succession line with no estate rights. Oba Gabaro forced his dissenting brother into exile in Apa/Badagry. There, Akinsemoyin met Joao de Oliveira, a former West African slave who became a top Brazilian slave estimator, shipping magnate and buyer. De Oliveira was too commercially and strategically gifted to be kept a slave in Brazil, so he was inverted into a senior associate of Portuguese moguls providing commercial intelligence and smart investment guidance on how to make it big in the West African slave markets. He founded the thriving Port Novo slave port. When Gabaro died in the 1750s, Akinsemoyin brought along de Oliveira from exile to optimise the case for slavery and make Lagos a safe space for slave trade. In 1770, de Oliveira retired rich in Brazil after 37 years in the business, taking with him four interested chiefs of Akinsemoyin. Around 1780 when Ologunkutere (Oba Gabaro’s son) became king, he cut taxes, reduced regulation and incorporated free market dynamics as the enduring framework for a successful slave business, hence attracting leading Portuguese entrepreneurs like Francisco Felix da Souza, Domingo Jose Martinez, Domingo Bello, Senhor Nobre, Francisco Jose Godinho, Eduard Gantois, Dos Santos, and Pereira Marinho. By the end of the first half of the 19th century, Lagos had become the port of choice for amassing high value obedient slaves. The huge money accrued from trading in fellow human beings made the quest for Lagos kingship a do-or-die game of thrones, with each new king since Akinsemoyin worrying about attacks from his own relatives more than attacks on Lagos from its enemies. All princes considered themselves war generals first, then prince afterwards. When Ologunkutere died in 1803, his popular younger son Adele was crowned over the elder Eshilokun who was really not interested because as a prince he was already wealthy from slavery and did not want his private wealth to be a public purse shared with Lagosians. However, the windfall from slavery declined and Oba Adele was deposed. Eshilokun was invited to rule and so slavery boomed and prosperity followed. When he died in 1829, his eldest son Idewu Ojulari was crowned. But latter’s chiefs later regarded him as too tight-fisted with wealth and his self-centredness was exceptional. To salvage his dignity, he was invited to commit suicide in 1835 else… Kosoko, his younger brother thought he would be the next to rule. Instead, the unpopular Adele, husband of Madam Tinubu, was brought back from exile. He died two year later in 1837. Kosoko tried again. Instead, Prince Oluwole, the son of Adele was crowned. Oluwole became first Oba to be blown to pieces in his palace in 1841 when lightning struck the gunpowder he had stored to fight his enemies. His corpse was identified by the royal beads that once decorated his limbs. Instead of Kosoko again, Akitoye the son of Ologunkutere, a brother to Adele and Eshinlokun and thus an uncle to the last two Obas and to Kosoko was crowned in 1841. Why was Prince Kosoko continuously overlooked? Like Helen of Troy whose face launched a thousand war ships, Kosoko had seduced, obtained and deflowered an afrosexual lady of breath-taking top down beauty. Coincidentally, Chief Eletu Odibo, the head of the kingmakers was interested in this lady too. Enraged at his loss to a young man, he incessantly found grounds to deny Kosoko the crown. Kosoko no longer accepted the status quo and vowed to take the crown by fire and force. It was in the middle of this turmoil that Oshodi Tapa returned from his Brazilian training. He hitched his allegiance to Kosoko, the son of Eshilokun who saved him from slavery. From exile in Badagry, they used the ship of a business partner Jose Domingo Martinez to sail exultantly from Whydah to Lagos and announced to Lagosians the imminence of war; it was time to choose sides. In conciliatory gesture to pre-empt war, Akitoye invited Kosoko back from exile and gave him an estate to rule over. This only led to Kosoko’s winning over more people. In July 1845, Oshodi Tapa led the strategic war that became known as Ija Olomiro (battle of saltwater), because deliberately stretching the war meant that Akitoye’s forces were cut off from fresh water supply and they could not survive drinking from the ocean surrounding them. Akitoye fled to Abeokuta, his mother’s town, which had become the hub of missionaries, returning Sierra Leonean ex-slaves and later a settlement for returning Afro-Americans like Martin Delany and Robert Campbell. Campbell later went to Lagos to found the first Lagos newspaper, The Anglo African. 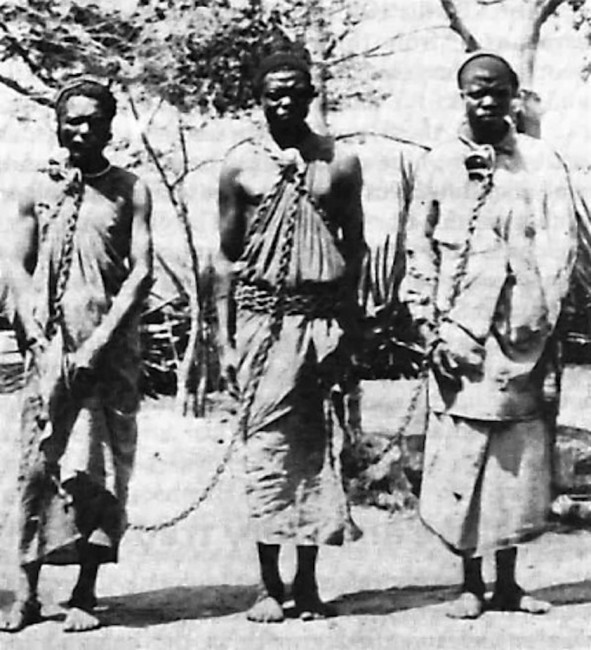 Akitoye told the missionaries that he stood ready to assist the British to stamp out slavery if they helped him get back his throne from his nephew. Ajayi Crowther whom the African Squadron of the Royal Navy rescued 28 years earlier had become a famous missionary of the British Empire. On November 18th, 1851, at Windsor Castle, he had an audience with Queen Victoria and her husband Prince Albert and told them that “the slave trade in that part of the African coast would be at an end if Lagos, the stronghold of its greatest support, was destroyed.” He also met with Sir Francis Baring, the head of British Empire’s Navy. A month later, Lagos was attacked. Oshodi Tapa organised the defence. It was a sea-to-land battle. First was the security of the gunpowder supplies which was the lifeline of war. War was won or lost by the effectiveness of the artillery unit which had moved away from bow and arrows to cannon fire, rockets and muskets. Hence, gunpowder was key. So that the Oluwolean Tradegy would not repeat itself, the gunpowder magazine was shielded from the possible range of the British cannon fire. An embankment was dug two mile along the Marina (which today is from Onikan to Apongbon) to provide excellent cover for the 5000 men firing muskets. The larger warships, HMS Penelope and HMS Sampson with more lethal power stayed off Bar Beach, between Ahmadu Bello Way and Atlas Island because of the shallow waters of the Lagoon leading to the palace. So the Royal Navy relied on HMS Bloodhound, HMS Taezer and numerous smaller boats from bigger warships. Oshodi Tapa anticipated this. The more the impending battle was cut down to an infantry-to-infantry combat, the more the chances of wiping out the British. But if the ships with their 32 pound calibre cannons were engaged, Lagos may not stand a chance. Hence, double rows of spiked coconut tree stems were staked underwater to further deny any ship or boat the required navigation depth should they press ahead ashore. Other stakes were extended above sea level to form piles for intermittent emplacements in the coconut mangrove along the shore. On them were placed long range cannons. Sure of his strategy, on Christmas day 1851, Oshodi Tapa ordered shots fired at the British ships which had for weeks collected together under a white flag of truce to map out their strategy. Oshodi’s motive was to entice them quickly towards the waiting perdition. The following morning, shortly after the British flotilla lead by HMS Bloodhound began to sail inwards to Lagos Island. At Onikan part of the Lagoon, Teazer was grounded due to the dry season, shallow depth and the low tide. Oshodi’s forces went ballistic on her with a battery of two twelve pounders while the Taezer’s 32 pounders kept quiet. They were still sailing under a white flag. By half past two in the afternoon, Captain Lyster quickly formed a landing party of 200 marines on eight smaller boats to spike the shore firing before Oshodi’s forces moved their long range cannons close and inflict a fatal wound on Taezer. By the time the marines landed with overwhelming show of force, Oshodi forces ran away. But as the Yoruba say, agbo to fi eyin rin, agbara loo lo mu wa (A ram stepping back in the middle of a fight should not be mistaken as retreating but rallying fury and power). The marines were ambushed and eventually, one officer and thirteen men were killed, four officers and over sixty men were wounded including Lieutenant Corbett. One of their boats was captured by Oshodi’s soldiers. It was the turn of the Royal marines to become the retreating ram. Five kilometres down the lagoon, around where today is the Leventis, Bloodhound had ran aground too and the other boats hit the first underwater ‘roadblock’. When William Stivey, a carpenter from a boat of HMS Sampson went neck deep in the water with an axe, hewing at the ‘roadblock’, Oshodi Tapa’s forces bombarded them with musket fire from the Marina embankment and cannon fire from the mangrove emplacements. It was a bad day for the Royal Navy. Some of the Lagosians who escaped the inferno fled to the northern outskirts to form a settlement called Agidingbi – an onomatopoeic description of the thunderous pounding of landing cannon. (Kiriji describes the recoil of a cannon fire). Kosoko and Oshodi Tapa fled eastwards to Lekki. 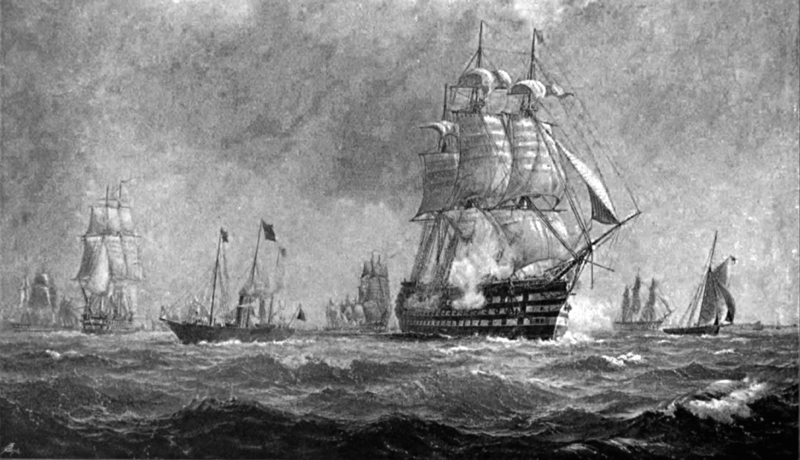 The defeated were encouraged to flee far from Lagos because the Royal Navy needed people to spread the news to the interior that there was a new force in town: The British. 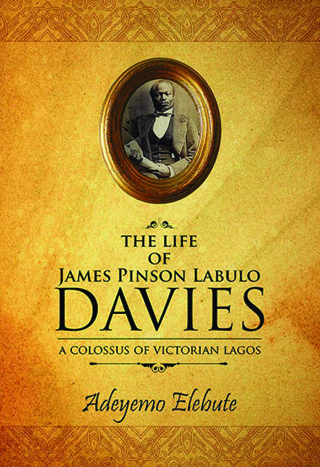 On board the Bloodhound was Captain Labulo James Davies (the subject of Adeyemo Elebute’s outstanding biography) who as a son of Yoruba slaves freed by the British had preferred not to invert into a slave merchant but was helping the anti-slavery squadron of the Royal Navy. 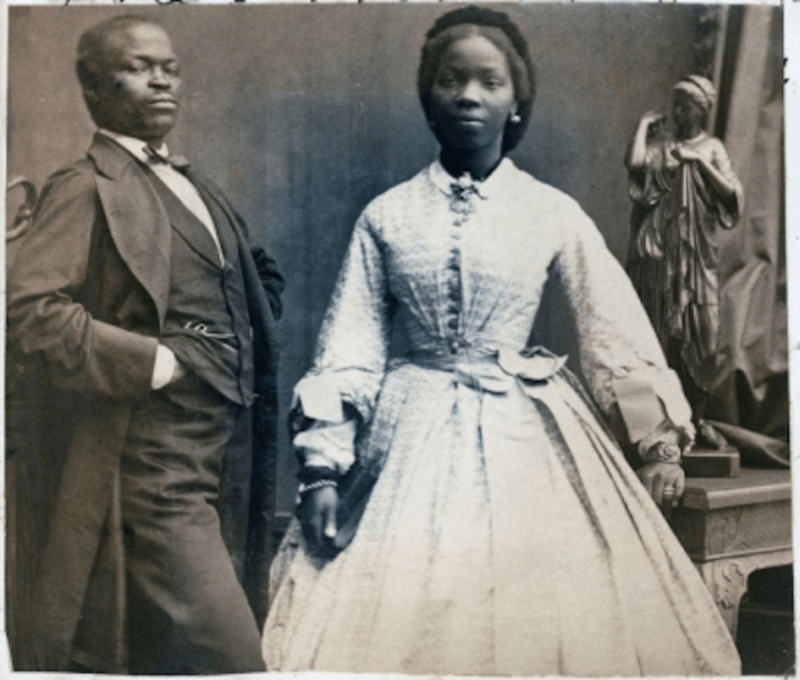 Later, Queen Victoria personally asked her goddaughter Aina Forbes Bonetta to marry Labulo. They had an elaborate wedding at St Nicholas Church Brighton in 1862 which Her Majesty paid for. The sailor who drove the Bloodhound was a Yoruba man too, John Johns, who abhorred slavery and whom the Royal Navy relied on for his local geographical and maritime knowledge. In his combat post-mortem to the Royal Navy, Davies said had Oshodi Tapa made greater use of his fleet of war canoes with their swivel guns and cannons, rather than relying almost entirely on static defences, he might have inflicted greater losses on the British and prevented their landing parties from reaching the shore. Today, there is a memorial at St Ann’s Church, Portsmouth with the names of even West Africans who fought on the British side during the bombardment of Lagos. There is no memorial in Lagos erected to the memory of Oshodi’s dead soldiers. We do not know their names nor how many they were. The huge profits from slavery were too addictive that while in exile in Lekki, Kosoko and Oshodi Tapa drew on the Ijebu supply pipeline to continue the trafficking with Lekki port becoming their new loading bay. Even the treaty to abolish slavery, which on January 1st 1852, Akitoye went to sign with Commander Bruce and Beecroft on board the HMS Penelope proved empty. His own son Prince Dosunmu was an active slave dealer. When Kosoko and Oshodi Tapa routed Akitoye from the palace, Domingo Martinez, his chief slave trade partner who made one to two million dollars during Akintoye’s reign, provided him with his guest house in Ajindo (8 miles east of Badagry) where Martinez maintained a slave depot. He also helped him reach out to Kosoko so that differences could be settled and all parties could enjoy the slave boom. In January 1855, Madame Tinubu, an ex-slave who rose to become one of the greatest slave traders of her time organised the assassination of the Consul Robert Campbell when it became clear the British were truly serious about stamping out slavery in Lagos. Tinubu had enormous trade surplus and credit lines with both European merchants and hinterland dealers like Efunsetan Aniwura, Iyalode of Ibadan. Tinubu felt that the British wanted to destroy all she lived and laboured for. She decided to take pre-emptive action. Her financial prosperity and political power was what mattered, not the suffering of slaves. Prince Dosunmu after the death of his father in August 1853, also merely paid lip service to the abolition of slavery. In 1858, Lagos had a population of around 25,000. Ninety percent were slaves. The remaining 10 percent owned them. Then in 1861, the British took the extraordinary step of annexing Lagos as a Crown estate. This provided the legal framework to deal with Lagos-based European slave corporations, their agents, their maritime certifications, the insurance companies of their ships, their credit lines and the slave-owning British Lagosians. According to Lord Mansfield’s 1772 ruling, once a slave step unto an English soil (British soil after 1807 with the outlawing of slavery throughout the British Empire), he or she should be considered free. Lagos then became a place of refuge for slaves from Ibadan, Oyo, Kano, Benin, Onitsha, Calabar and their environs. The British government did not only salt the slug of slavery, they offered lucrative markets for farm produce like palm oil, cotton, rubber, tea on a large scale. This turned the likes of Oshodi Tapa and Madam Tinubu to agents of Liverpool and Manchester traders. They still became rich and powerful while those they sold into slavery continued their miseries in the sugar plantations of the Caribbean and the cotton fields of America. Oshodi Tapa helped broker peace with the British government which facilitated the return of Kosoko and his supporters to Lagos. He continued to help turn Lagos into a safe space for British designs. It was Oshodi Tapa’s private army that Governor Glover depended on when he routed the Egba army from Ikorodu, which was Ibadan’s trade route to the sea. Oshodi was presented a sword by Edward Cardwell, Secretary of State for colonies being a dependable British asset. On the sword were the inscription: “presented by the Government of Queen Victoria to Chief Tapa in commemoration of the loyal services rendered by him to the Government of Lagos.” The personality who worked hard to prevent British from gaining a foothold in Lagos in 1851 became their principal defendant. When the facts change, Oshodi Tapa changed his loyalties too. He was above destiny and immune to history. He was a boy prince who became a slave, an ex-slave who became a slave mogul, a war lord who became a statesman. Rich in circular contradictions, the life of Oshodi Tapa is a natural material for any scientist who wants to use modulo mathematics to explain the human mind and add to the theory of artificial intelligence or artificiality of conscience. Modulo mathematics, let me hasten to add, deals with numbers that circles back around onto themselves like the hours of a clock.